A few notes about these units. patterning through to dead set. French but we can overcome that. themselves into standby after a predetermined time!! On going investigation. the audios on MAC board when viewed from rear). A. Flicker mod-- Change C2337 ). 0.47uF to 0.1uF. On MAC board. C. Remove VCR (magnetophone) scart pin 8 series resistor R 3062. Then link Tv and VCR scart pins 8 together. Now switching unit into standby will remove "pin 8's 12volts. 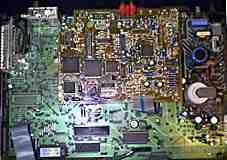 The other mod to maintain CVBS on pin 19 of Tv scart is much more complicated on the 916 so I would give it a miss. Regarding the 56R resistor in place of link 9202 -- don't do this unless you use a RDV/Torrid card., it prevents updating of multimac MM303 cards with remote control. These units are very fussy about which pic cards they will work with, and definitely will not auto switch between eurocrypt M & S or the card slots. Has to be done with remote control. Everyone who would like to use the attached circuit should be extremely careful! Special care must be taken since the PSU can be touched, when the Visiopass is open. There is no additional shield against electric shock and there are some wires without isolation that carry harmful voltage. Even more care must be taken if you take the main board out of its mounting and view it from the solder side, AND have it connected to mains. So disconnect mains when you are inside there, unless you are adjusting something and need a running PSU. It is a good idea always to have a look at the end of the mains cable automatically, before one puts his fingers into any equipment, to check that it is not plugged into an outlet. The Input signals to the RGB to PAL encoder can be found under the decoder board on the component side of the main board. RGB can be found at R3710(red), R3713(green) and R3708(blue), at their end closest to the scarts. The composite sync can be found at R3022 (2k2) at the end closest to the connector for the Decoder board. A 12V connection must be taken as a supply. There is also a 12.5V supply point on the board, DO NOT TAKE THIS ONE! Take care not to bend the connector to the Decoder when taking the Decoder off or reassembling it. Read and follow the short text under the diagram! I killed 2 MC1377's by being careless with input signals! So, I hope this is of use for anyone and there are no people out there who had a business doing exactly what I describe. Anyway only persons with a little experience will be able to do this. "RGB" and (composite) "sync" signals come from main board. Set all Pots and trimmer to middle position ! After supplying power and the four input signals, a TV connected to "PAL output" should at least show a black/white picture. If not, check everything again! If a picture appears, adjust 30pF trimmer and sync level pot at pin1 to show a coloured picture. The 1k pot at pin9 allows to adjust signal strength. Use 30pF trimmer, pot at pin1 and pot at pin9 to give the best visual results. Change 10k pot at pin2 from middle position only if you cannot get a coloured picture by other means. Be careful with it, if the voltage at pin2 gets too high, the MC1377 could get damaged. If there is sufficient interest, a kit of parts will be made available.